I did not know him well. Kristy, The Bear, and I had just completed a long cross country flight from Saginaw, Michigan to Sodus on a sunny, fall afternoon. Taxiing to our hangar, I pulled the mixture and quenched Warrior 481's internal fires. As the mechanical gyros spun down, humming quietly in the background, I checked my cell phone at just the right moment to receive an email reporting that fellow aviator and Williamson Flying Club member Marv had passed away. Marv, a spry 77 years old, had been a fellow Cherokee owner on the field. Before I ever knew his name, I had encountered him a few times while preparing to fly. He would stop to chat, smiling infectiously and expounding on the allure of the clear blue sky, his eyes twinkling with an aviator's passion for flight. I did not know him well, but I was privileged to fly with him once, just a few weeks before he passed. 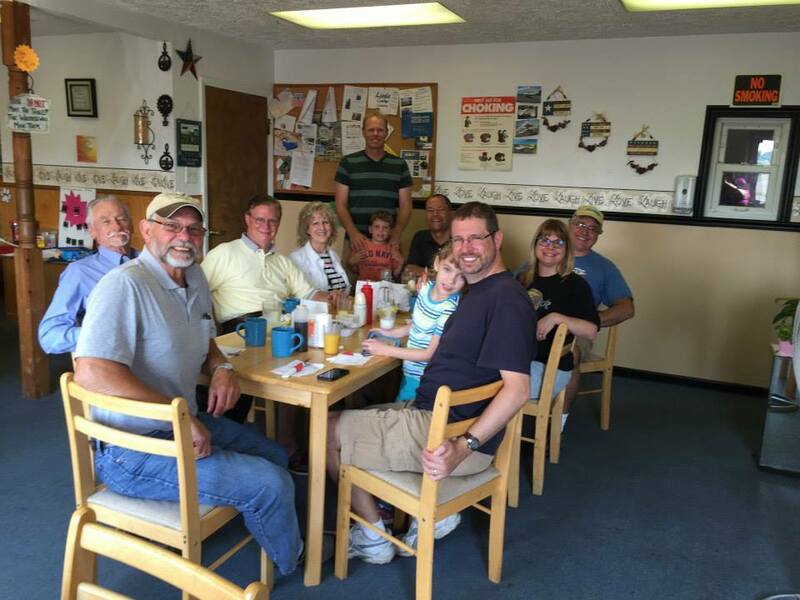 We planned a fly-out to the Oswego County Airport ("Fuzzy") on August 16 for breakfast at Puddle Jumpers. That morning, we mustered eleven people who flew to Oswego in four airplanes. Aboard Warrior 481 was myself, The Bear, and Lee. Lee is a student pilot who has flown with me to past events and it is always a pleasure to have him along. When Lee asked if Marv could join us, I was only too happy to offer the Warrior's last available seat. Marv had mentored Lee, nourishing Lee's love of aviation with frequent flights in his Cherokee. On the ground at Oswego County, once out of earshot from the rest of the group, Lee quietly explained that Marv had been diagnosed with cancer. A few months prior, his condition had forced him to surrender access to the sky; he sold his Cherokee. Our short hop to Oswego County that morning was Marv's first time in the air since selling his beloved airplane. I was stunned; Marv seemed so happily robust that I would have never guessed at his illness. After breakfast, back at altitude, I trimmed the Warrior and leaned for cruise. "Marv, would you care to fly us home?" I asked. Out of the corner of my eye, I noticed Lee flash an approving thumbs up from the back seat. Marv smiled his charming smile and took the controls, smoothly guiding us back to Sodus. Back on the ground and parked at the fuel pump, Marv gripped my shoulder in thanks, his eyes twinkling in delight. He loitered while I fueled the Warrior. When I was done, he offered some cash to cover the fuel cost. I refused it with a smile. "Thank you," he said, a hint of a tear welling in his eye. "You don't know what this means." He gripped my arm, silent gratitude flowing through the contact. In that moment, I genuinely believed that I understood the significance of that morning's flight. But I didn't. I was focused on the wrong aspect: the months elapsed since his previous time aloft. I did not know that I had just given this wonderful flying man his final time at the controls and that I would never see him again. It was not until five weeks later, when I read of his passing to the somber requiem of decelerating gyros, that I understood completely. I did not know him well, but I wish that I had. It was my fourth flight of the year to Oakland County International in southeast Michigan. The reasons for these trips have varied widely: a check-in with my nursing home bound grandfather, participation in a curriculum advisory committee at the University of Michigan - Flint Chemistry Department, and a quick end of summer vacation that included a trip to The Henry Ford. This particular flight was driven by a last minute invitation to the University of Michigan home football game against Brigham Young University in appreciation for my support of the Chemistry Department. Despite having graduated over twenty years ago, neither Kristy nor I had ever attended a game. It was never really our scene, but with the opportunity being dangled in front of us, how could we refuse? The Bear was along for the ride, planning an exciting day with Grandma while Kristy and I attended the game. We landed at Oakland County International just as the sun slipped beyond the horizon. I told my mother to expect a 7:30 pm arrival and, indeed, we taxied onto the Michigan Aviation ramp at 7:27. The next morning, Kristy and I met our hosts, Nick and Jess (faculty from the University of Michigan - Flint Chemistry Department), in Hartland. From there, we plunged into the chaos that is Ann Arbor on game day. For those unfamiliar, Michigan football is a big deal. The program has struggled over the last two years, but with a new coach - a favorite son returned home - anticipation of restored glory is so high that it is palpable. Our seats were on the 25 yard line in the twelfth row. Michigan Stadium is known as The Big House for a reason. It is the largest stadium in the United States and the second largest in the world (according to the most recent statistics that I could locate with a casual search). Attendance at our game was officially announced at 108,940 and it was declared the 261st (if memory serves) consecutive game with attendance exceeding 100,000. I don't care where you come from, these people take their football seriously. Spirits ran high as Michigan shut out 22nd-ranked BYU 31-0. As the clock ran out, Nick summed up the game perfectly. "If Harbaugh turns this program around, you can say you were there to see the start of it." Indeed. We topped off a great day with a visit to the Ann Arbor Brewing Company followed by dinner at Gratzi. My sincere thanks go to the University of Michigan - Flint for treating us to a really fantastic day. "Warrior 481, contact Flint Approach on 118.8 and enjoy your flight to Saginaw!" This from Detroit Departure as we cleared Pontiac's airspace to the north. "Flint on one one eight point eight, wilco on the enjoyment," I responded. Suddenly, air traffic control seemed very insistent that I have a good time. Thirteen years ago, I planned a VFR cross country flight from Elkhart, Indiana to Saginaw, Michigan (MBS International Airport) for my private pilot check ride. On that September day in 2002, we only flew nine miles of the planned flight. After all this time, we were about to actually land at Saginaw, the 165th unique airport that I've landed at since I started flying. From there, we met our college friend Cher for breakfast at Maggie's Omelet Shoppe in Bay City. It is always great to visit with Cher when we are back in Michigan, even if the visits are always too short. Despite their expensive fuel ($6.20/gallon! ), the folks at AvFlight-Saginaw were very friendly and their renovated facility is well appointed. We launched from Saginaw cleared on an instrument route intended to minimize passage over large stretches of both Lake Huron and Lake Ontario. We overheard Cleveland Center managing an aircraft that was suddenly "negative RNAV and negative FMS." In other words, the pilot had lost the ability to navigate by GPS and was clearly en route to a GPS-defined navigational fix. "Can you still navigate to the fix?" queried Cleveland. "Beats the heck out of me," came the non-standard response. It was not exactly a declaration of an emergency, but a clear indication of a problem. We were handed off to Toronto Center before learning how the situation was resolved. This is typical. From our perspective, most of the tiny dramas that we overhear playing out in the national airspace system end in perpetual cliff hangers. Established on our route at 7,000 feet under a beautiful clear sky, we took some family portraits. The Bear fell into a sound sleep almost immediately after departure, using my flight bag and fleece jacket as a pillow. Warm sun plus a smoothly running airplane and a belly full of pancakes worked their magic just as they have since she was a toddler. It's always good when the old equations still work. Unfortunately, it meant that she slept through the most spectacular part of the flight that came as we reached Lake Huron. Our course through Michigan's thumb region brought us into convergence with the western shore of Lake Huron. Despite the overall sunny day, stratus clouds defined a unique micoclimate associated with the south end of the Great Lake. After a few moments in the clouds, we found ourselves between layers for the next leg of our journey. Ahead of the right wingtip, the St Clair River defined the international border. We were briefly feet wet over the south end of Lake Huron, but always within gliding distance of shore. During that time, we were surrounded by water, condensed and otherwise. After a few minutes, we made landfall on the Canadian side some distance north of the well-worn track of our typical route. Then, there it was. Does anyone else hear Judy Garland? Evidently, the "somewhere" in this case is Plimpton-Wyoming, Ontario. Who knew? As we left Lake Huron behind, its influence on the local climate finally waned. A few minutes west of the Niagara River, The Bear announced her need for a restroom break. After crossing back into the United States, I cancelled IFR with Buffalo and diverted to Akron. "Warrior 481, say reason for diversion." "Um...we have a...passenger...comfort issue." Smooth. It seemed like a radio-appropriate response, however. Buffalo's acknowledgement indicated that my meaning was well taken. We dropped into the pattern at Akron during a visit from the Commemorative Air Force's T6-Texan (actually, its tail indicated that it was an SNJ). Two Stearman biplanes and a WWII era L-Bird were also hopping rides. I came in too hot, landed long, and hustled to the ramp. I am happy to report that we/she made it! Afterward, I tried to interest The Bear in the cool antique flying hardware on the ramp, but she was tired and just wanted to go home. So we did. When I cut the engine in front of our hangar in Sodus, The Bear presented me with this "excited to be home" face. Could there be any better way to end a wonderful trip by airplane? When flying, the rainbows always lead back to home. 2015 has been a year of much cross country flying and very little drilling on fundamentals. So, with a bit of a squirrely crosswind afoot, I decided to polish up on landings. I am glad that I did. The first two were borderline embarrassing, though not so bad that I left any Piper parts on the runway. I waited my turn behind two club Cherokees. I was not the only one looking to hone his landings that day. As I made landing after landing in the mild, but variable crosswind, I found that the touchdowns became smoother and the runway distances used became progressively shorter. Before my last trip around the pattern, I waited for Cherokee N9855W to launch. I flew rides in this airplane during the Williamson Apple Blossom Festival Pancake Breakfast back in May. She is a nice flying, smooth running ship. My only tense moment at the controls of this airplane came during my final passenger flight of the day. On take-off with a full load of passengers, I reached tree-top level only to have a gust impart a powerful, rapid, and entirely uncommanded roll to the right. I countered with full left aileron, bringing the unfamiliar bow-tie style yoke down on my own knee hard enough to leave a substantial bruise. My heart was racing for the remainder of the flight after the abrupt, near-upset. My passengers, on the other hand, seemed not to notice, laughing and chattering throughout the short flight along the Lake Ontario shore and thanking me for a great flight once we landed. Once I decided that my landings were dialed back into their normal envelope of proficiency, I departed on a short cross country flight. With nowhere in particular to go, I contacted Rochester approach and requested flight following to my old home - one of many at this point - in Le Roy, NY. Fall is an unmasking, a withdrawal of chlorophyll that reveals the hues underneath. As I flew to Le Roy, fields were starting to transform in a foreshadowing of full-on autumn. This is my favorite time of the year. On the ground at Ray's "fine establishment". I think the Warrior liked being back. I had a nice chat about ADS-B solutions with an old friend. I find it a shame that the genuinely exciting ADS-B upgrade options involve more expense than I can actually justify. Nevertheless, I am finally narrowing in on a plan for compliance with the FAA's latest "pay to play" boondoggle. Within seconds of pitching skyward from Le Roy, still below tree-top level, I noticed a bit of movement in my peripheral vision. I instinctively reached out with my right hand, palm up, just in time to catch the Warrior's compass as it fell out of its holder on the windscreen. That could have been messy. Looking north along I-390 toward Rochester from over the NY-15A interchange. I was about to (inadvertently) fly over the site of my new job. Fairport, one of several Rochester-area ports along the Erie Canal. I returned to the Williamson-Sodus Airport, my need for flight satisfied for the time being. Like flickering images played back on antique celluloid, distant childhood memories persist into adulthood as isolated remembrances. For me, these disconnected images often lack narrative and context, but their longevity over decades suggests that they were strongly imprinted on my younger self. One such childhood image is that of a locomotive, still resting on the rail that brought it to its final destination within a museum. It towered above me, coal black, a veritable wall of steam-driven machinery. I was awed by its massive, brooding presence. It is one of my few surviving memories of the The Henry Ford Museum, last visited when I was younger than The Bear is now. I was so impressed by what I saw in that place as a child that I have long wanted to share the experience with my daughter. Since my encounter with "nature's power washer" earlier this summer, I can happily report that Warrior 481's nose gear wheel fairing is refinished with fresh Acry-Glow paint. Jeff in Ray's shop did most of the work and he did a great job. "Hey! Look at that wheel pant!" exclaimed Ray's voice on Unicom as Kristy, The Bear, and I taxied past the open B.A.C. Services hangar door on our way to runway 10. Aloft, I broadcast, "Williamson-Sodus traffic, Warrior 481 and its wheel pant are departing the pattern to the west, Williamson-Sodus." The frequency was otherwise silent and I suspect that only my intended audience heard the transmission. Low cloud and haze lay thickly over Upstate New York as we launched in relative clear and set course for southeast Michigan. Forecasts for our time of arrival suggested that we would find our destination, Oakland County International ("Pontiac"), VFR under a broken cloud layer at 3,500 feet. Parting clouds revealed the Niagara River below. How many times have we flown over the falls in the past decade? I never grow tired of seeing them. My "captain's announcement" on the intercom about the falls passing to our left angered The Bear, whose game was temporarily muted in deference to my announcement. As she grows older, she seems to be losing interest in watching the world pass beyond our airplane's windows. Across Canada, we were often above the clouds. Warrior 481 received a bath aloft in a light rain shower and we flew through a few higher clouds, raised like an illusory barrier to our passage. At one time, they would have been a true barrier, albeit a legislated one, but no more. Near the international border, we were able to receive the ATIS at Pontiac and, although the clouds were breaking up as we approached the St. Clair River, conditions at Pontiac were 900' overcast. Compared to the vast depth of the atmosphere, this was a subtle deviation from forecast, but it meant that the field was now legally IFR rather than VFR. "...localizer back course two seven left approach in use..." intoned the recorded ATIS information broadcast out of Pontiac. Huh. I've never flown one of those before. For Kristy's benefit, this dialog stayed strictly internal. Both of Warrior 481's course deviation indicators (CDIs) shown at frame left. For the uninitiated, a pertinent lesson in aeronautical jargon. The gold standard for precision instrument approaches is the ILS (instrument landing system). Among other components, the ILS includes a localizer antenna array that provides aircraft with precise lateral (left/right) guidance on approach to a specific runway in low visibility conditions. Left/right indications are presented to the pilot by the swing of a vertical needle on a course deviation indicator (CDI, shown above). The same localizer signal can also be used to provide lateral course guidance to aircraft landing on the reciprocal runway (same strip of pavement, opposite direction). This is known as the "back course". However, because the aircraft is flying in the opposite direction to that which the localizer was built to accommodate, the cockpit indications are reversed. 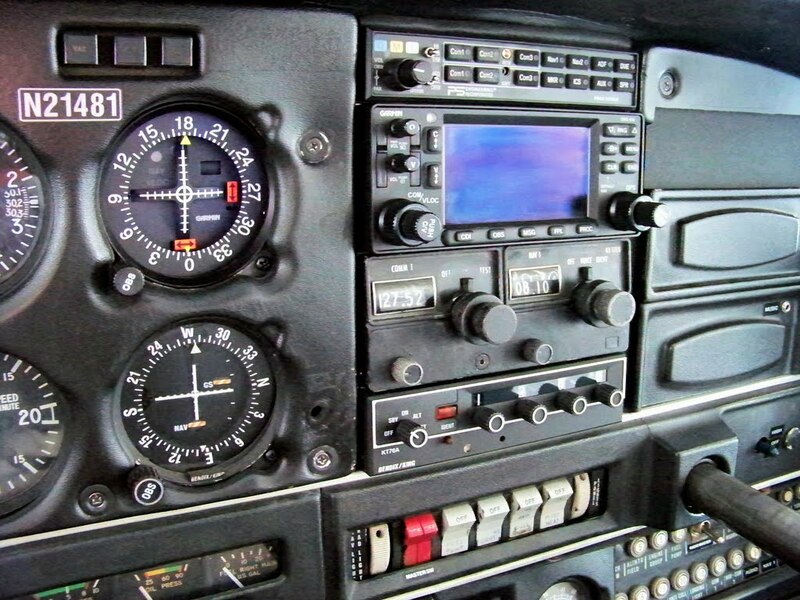 Instead of correcting toward a deviating needle, the pilot needs to turn away from the needle. This "reverse sensing" requires a significant mental adjustment on behalf of the pilot. As I learned from Martha King, I would need to "drag the needle". Thank you Martha! Localizer back course approaches are relatively rare. There are none in the Rochester area, which is why I had no experience with them. My closest experience is flying the missed approach procedure for the ILS at Genesee County Airport (KGVQ), which requires tracking outbound (away from the airport) on the localizer, resulting in the same sort of reverse sensing on the CDI. I understand that I could have requested the RNAV (GPS) approach to the same runway, but also thought that it might be fun to fly the back course. When Detroit Approach instructed me to expect the localizer back course approach for runway 27L, I did not object. As we flew farther west into Michigan, the clouds thickened and rose to nearly meet our 6,000 foot cruising altitude. As we skimmed the cloud tops, I briefed the back course procedure and set up the instruments. As I listened to Detroit Approach clear other aircraft to fly the back course into Pontiac, it sounded to me like he was saying "Bad Horse" every time (the "Thoroughbred of Sin" from Dr. Horrible's Sing-Along Blog). "So make the Bad Horse happy, or he'll make you his mare..."
Then it was our turn; we were cleared to descend and given a vector to intercept the final approach course. Within moments of reducing power, Warrior 481's nose dipped earthward and we slid below the surface of the ethereal sea. This was Kristy's first extended flight through clouds on an instrument approach. More worrisome to her than the blind descent, however, were the other radio calls we heard. One pilot was taking up an inordinate amount of our controller's attention with his inability to properly set his transponder. Another pilot, apparently confused, had his approach clearance to Pontiac rescinded and was vectored away from the final approach course. The notion of bewildered pilots-errant bumbling through the murk was very alarming to her. I intercepted the final approach course while muttering a mantra of "drag the needle" under my breath (again: thank you, Martha). The mist pressing against Warrior 481's windows transitioned from white to gray and grew progressively darker as we lost altitude. We sank earthward through nearly 5,000 feet of cloud before dropping out of the bottom at roughly 900 feet. The runway was immediately before us. We found ourselves in what seemed a gloomy underworld after cruising so long in the sunlight. I adjusted power, set landing flaps, and rolled Warrior 481 onto runway 27L in the smoothest touch down I have ever made at Pontiac. I waited until after receiving taxi clearance to Michigan Aviation to tell Kristy that I had never flown that sort of approach before. The Henry Ford Museum (and associated Greenfield Village) are only a small part of the legacy left behind by Henry Ford. Ford started his career with Thomas Edison's Detroit Edison company, eventually becoming Edison's Chief Engineer. His tinkering with gasoline engines was supported by Edison. Eventually, Ford resigned and, after one failed automotive venture, founded The Ford Motor Company in 1903 with partial financial backing from the Dodge brothers. Ford is widely recognized as the father of modern industrial manufacturing with his introduction of the moving assembly line that increased efficiency and reduced the cost of goods. He was often regarded as too paternalistic (i.e., intrusive into employee's personal lives), he viciously fought early unionization movements (e.g., Battle of the Overpass), and he published prominent antisemitic writings that earned him accolades from Adolf Hitler. To his credit, however, Ford also recognized that paying good wages not only aided in attracting and retaining talent, but that it enabled his workers to purchase the very automobiles that they manufactured. In this way, he planted a seed that led to the development of Detroit's prosperous middle class. In today's world of stagnating or even falling wages (relative to inflation), it is a shame that this notion has been abandoned by so many CEOs. The Henry Ford Museum was dedicated in 1929 as the Edison Institute in honor of Ford's friend, Thomas Edison. Dedication took place exactly 50 years after Edison's invention of the incandescent light bulb. The original cornerstone bearing Edison's signature and footprints in concrete is on display in the entry hall to the museum. "I am collecting the history of our people as written into things their hands made and used.... When we are through, we shall have reproduced American life as lived, and that, I think, is the best way of preserving at least a part of our history and tradition..."
Kristy, The Bear, my mother, and I drove from Oakland County International Airport to The Henry Ford in Dearborn, an immediate suburb of Detroit. As we crossed the Detroit city limit, I said to The Bear, "it's your first time in Detroit!" The Bear responded with an extraordinarily deadpan, "yay." When we entered the museum, we learned that the new Brian Terwilliger documentary, Living in the Age of Airplanes, was showing at the museum's IMAX theater and immediately bought tickets. We enjoyed the movie and, as with One Six Right, the cinematography was beautiful. The film's focus on commercial aviation meant that it did not illustrate the romantic aspects of flying as capably as its predecessor, but it nonetheless delivers a well-made point about how our society takes aviation for granted. And for her part, The Bear thought it was cool that Han Solo narrated. The first exhibit we explored was entitled "Heroes of the Sky" and featured this beautiful Douglas DC-3. Most people associate Ford's aeronautical output with the Ford Trimotor, but before the Trimotor came the less successful Flivver (it was much, much less successful). Only three or four were ever produced and Charles Lindbergh was one of only two pilots to ever fly one. The Flivver on display here is the first one constructed. The Bear enjoyed this interactive exhibit on navigation by four course (or "A-N") range. I think this demonstration convinced her to leave the instrument flying to me (for now). "To commemorate his flight from Belmont Park to Garden City Estates, he being the first American aviator to fill a dinner engagement in an aeroplane..."
This 1911 trophy appears to celebrate the first $100 hamburger flight by an American, Earle Ovington. No one ever presented me with a trophy for a pancake run, but that is just an example of how times have changed. This Ford Trimotor, while under the command of Admiral Byrd, was the first aircraft to fly over the South Pole in 1929. It replaced a Fokker Trimotor that Byrd originally intended to use and, thus available, the Fokker was bought by Donald Woodward as the flagship for his grand airport in Le Roy, NY. Many years later, this Ford Trimotor presided over the wedding celebration of my friend and fellow aviator, Steve. This 1920 Dayton-Wright RB-1 was specifically built for racing, though it was only raced once. It featured retractable gear and was unburdened by the aerodynamic drag penalty of a forward facing windscreen (which means that it had zero forward visibility). All nose, no tail, and lousy visibility...looks like fun. This Fokker Trimotor, Josephine Ford, was purportedly flown by Floyd Bennett and Admiral Byrd to the North Pole in 1926, though discrepancies in Byrd's navigational data raised concerns about whether he actually reached his goal. Because this expedition was financed by Edsel Ford, Anthony Fokker painted the prominent "FOKKER" badges on the aircraft to ensure that no one mistook it for a Ford Trimotor! A Curtiss OX5 engine of the sort that powered the legendary Curtiss "Jenny". An engine shop adjacent to my former home base in Le Roy, NY is known for its skill in overhauling these early aircraft engines. This 1931 Pitcairn Autogiro was used by The Detroit News for aerial photography. It is claimed that this is the world's most accurate replica of the 1903 Wright Flyer. Just weeks before the Centennial of Flight in December 2003, this aircraft successfully conducted multiple flights under its own power at the Wright Brothers National Memorial in Kill Devil Hills, NC. If it is as authentic as claimed, then it must have been a finicky, cantankerous thing to fly. Kristy assisted The Bear in creating a paper aircraft that she and I test-flew. Our best flight: 22 feet; not too shabby. The signage associated with this Bleriot XI pokes fun at its accident-prone inventor, declaring him to have "crashed into history" (about fifty times, if memory serves). My Mom and The Bear hammed it up as we prepared to leave the aviation exhibit. We made our way to the train gallery, first encountering this enormous Canadian Pacific railroad snowplow. The 1858 "Sam Hill", a steam locomotive of the ubiquitous 4-4-0 design. By 1870, it is estimated that 85% of the locomotives operating in the United States were of this configuration. This particular engine bore Henry Ford, Thomas Edison, and President Herbert Hoover to the dedication ceremony for The Henry Ford (nee, Edison Institute) in 1929. Suddenly, there it was; the massive locomotive from my memory. The "Allegheny" locomotive, produced by the Lima Locomotive Works of Lima, OH. This example is the second of 60 built for the Chesapeake and Ohio Railway in the 1940s. Designed to pull heavy loads over steep grades in the Allegheny mountains, this engine reportedly generated 7,500 horsepower at 40 miles per hour. It is considered among the most (if not the most) powerful steam locomotive engines ever built. Only two of these 125 foot long locomotives still exist. It remains as impressive to me today as it was to my childhood self. A portion of the "instrument panel" of the Allegheny locomotive. For anyone who wants to spout off about "steam gauges" in airplanes, these are real steam gauges. We were collectively amused by the seal on the bottom of this tapestry proclaiming Michigan to be the "Tourist Empire of the Inland Seas". Though, to my way of thinking, it is not an inappropriate label. "What's a wiener?" asked The Bear. Don't worry, just smile. Before steam punk was cool, there were steam tractors. Kristy and The Bear hoped to take this New Holland Combine for a test drive, but they had to settle for merely sitting in it instead. I always knew that The Bear was an angel, but this photo actually contains evidence of it. What do you get when you cross Buckminster Fuller and an airplane factory with little to do in the wake of World War II? You get the Dymaxion House; a pre-fabricated, domed domicile with the interior look and feel of a 1940s aircraft. Only two prototype aluminum and Plexiglas Dymaxion houses were ever made. They were combined and lived in for thirty years by one of Fuller's investors before being donated to the Henry Ford Museum. It is amazing to me that a 36 passenger, 1948 General Motors bus built in Pontiac, MI could become a catalyst for the Civil Rights Movement. In 1955 Montgomery, AL, Rosa Parks quietly refused to surrender her seat to a white man aboard this very bus. This is how The Bear feels about segregation. This is how The Bear feels about Rosa Parks and what she did all those years ago. The Bear learned about Rosa Parks in school last year and, for her, it was magic to physically connect with an artifact from her limited, but growing knowledge of American history. Perhaps when she is my age, it will be this bus that persists in her memory of this day spent at the Henry Ford Museum. All of us were impressed by this clever exploded view of a Ford Model T.
The only other memory I had of the Henry Ford Museum from childhood was this: the presidential limousine in which John F. Kennedy was riding when he was assassinated. For my parents' generation, this was a defining moment in history much as the Challenger disaster in 1986 and the 9/11 attacks were for my generation. I suspect that my memory of the car was due more to my parents' visceral reaction to it than anything about the car itself. After the assassination, the car was modified with this permanent hard top and thick bullet-proof glass windows. This was FDR's limo, the "Sunshine Special". It inaugurated many decades of presidential limos built by Lincoln and leased to the Secret Service. This is Goldenrod, built by Bob and Bill Summers in 1965. With four Chrysler V-8 engines, Goldenrod developed 2400 horsepower and set a land-speed record for wheeled vehicles of 409 miles per hour at the Bonneville Salt Flats in Utah. It held this record for 26 years. It is basically a wheeled missile with a small cockpit at the far aft end. "Old 16" was the first American-built car to win the Vanderbilt Cup in 1908 on Long Island. This Ford-built "999" was famously raced by Barney Oldfield the early 1900s. Check out that radiator! And, of course, a legendary Ford icon: the very first 1965 Mustang ever produced. I dislike McDonald's, but love the retro neon sign. The tower over the main entrance to the Henry Ford Museum. In addition to the Henry Ford Museum, we took he Rouge factory tour. The Rouge was Ford's monument to twentieth century manufacturing might. As conceived, raw materials arrived by ship and finished automobiles rolled out of the other end of the facility in an impressive, early example of vertical integration. The modern Rouge facility builds Ford F-150 trucks and we toured the production line. It was fascinating, but much like the Ben & Jerry's factory tour, no photography was permitted. After the factory tour, we viewed a series of cars representing the output of Ford's Rouge facility over the decades. The Ford Model A, the immediate successor to the Model T, was the first car produced at The Rouge. Ford was so enamored with the new V-8 engine in this 1932 model that the car was known simply as the "V-8". According to museum signage, gangster John Dillinger was a fan of it too and reportedly wrote Ford to tell him so. Interestingly, the letter displayed at The Rouge is regarded by some as a hoax perpetrated by the Ford company as a means to sell cars. As a hoax, it may have been more self-serving than disingenuous. An older, more credible letter from Dillinger to Ford was found many years later. In it, Dillinger thanks Ford for designing a car that helped him escape "the coppers". The spirit of this earlier letter is very much aligned with that of the suspect letter at The Rouge, though it reads much less like Ford marketing material. A 1949 Ford Coupe, produced after World War II once The Rouge returned to making automobiles. Another classic: the 1956 Ford Thunderbird. And, of course, in 1965, The Rouge was producing one of my all time favorites: the Mustang. Cool stuff. On the bus ride back to the Henry Ford Museum, there was a goofy Little Bear sitting in front of me. When we took our leave of the Henry Ford Museum, it was with the knowledge that we had seen only a fraction of what the museum has to offer. The Henry Ford Museum makes it possible to witness history through artifacts in a way that can usually only be accomplished at the Smithsonian. Unfortunately, to have browsed the entire, fantastic collection would have certainly strained the limits of patience for The Bear. Our original goal on Saturday was a quick flight to Kalamazoo to meet with Kent and his family for lunch, but southwest Michigan was under a convective assault all morning and we sadly decided that it was best not to go. That afternoon, after touring The Rouge, we said goodbye to Mom and launched from Pontiac for the return flight to Sodus. This time, Kristy rode up front with me and The Bear watched Star Wars: Rebels videos on her Kindle in the back seat. Pontiac Ground coordinated with Detroit Approach and Cleveland Center to clear us for a nearly direct route home via the Aylmer VOR in southern Ontario (in lieu of traversing MOONN intersection). It was not the only MOONN we would lack on our flight home. The Pontiac Silverdome is domed no longer. Clear air and significantly fewer clouds made the eastbound journey home appear very different from the preceding morning. As we neared the St. Clair River, the dissipating vestige of a thunderstorm hung in the air like a ghost, an afterimage of atmospheric violence. The sun set midway through our journey across Ontario. For a time, we flew in an undifferentiated gray haze. In the humid twilight, no horizon could be discerned and ambient lighting prevented us from seeing ground lighting below. There was no visible moon. It was truly instrument flight under visual meteorological conditions. Kristy did not care for my reference to JFK, Jr in that moment, but we continued eastbound relying on Warrior 481's instruments for unwavering guidance. Forty miles to the starboard, thunderstorms raged over the Ohio-Pennsylvania border. As the twilight glow waned, we could see lightning discharging from the cumulonimbus floating over Lake Erie's opposite shore. Despite knowing that the storm was far off, the occasional flashes caught in my peripheral vision were nonetheless disconcerting. As night deepened, we were finally able to observe ground lighting that restored a visual sense of orientation in darkened space. Rochester Approach provided vectors around a small thunderstorm on the west side of the city, invisible in the near absolute darkness. We bumped through some clouds still possessed of their daytime energy. As I switched off the strobes, I noticed Kristy's hands move to clutch the bottom of her seat. She later confessed that the combination of flying through clouds, turbulence, and darkness all at the same time were a bit much for her. She requested that I limit our flight condition to any two of those three conditions in the future. I completely agree with this. Nighttime IFR is not something that I take lightly. In this case, the piling-on of risk factors was brief and, after a few minutes, lights from the city of Rochester reappeared below. We continued on to GOYER, an initial approach fix for the RNAV 10 approach at Williamson-Sodus. Crossing Irondequoit Bay, we seemed to leave most of the clouds behind and emerged into smooth, swampy summer darkness. Without a moon, the landscape toward which we descended was a black hole periodically broken with lights from rural towns in the vicinity of the airport. We visually sighted the airport just inside the final approach fix and landed in an unexpected crosswind (Williamson-Sodus' AWOS was broadcasting lies about calm wind). With temperature and dewpoint convergent, moisture from the thick humid air was actively condensing on the cool aluminum hangar roof as we packed our car and departed from the airport. In our 5.4 total hours of flight, we accomplished a number of firsts. It was my first time flying a localizer back course approach as well as Kristy and The Bear's first time experiencing an instrument approach following descent through thousands of feet of cloud. The return flight put all three of us in nighttime IMC for the first time, though it was brief. For now, it will be my goal to keep it that way. IMC aside, it was Kristy's first night flight since we moved to New York from Michigan nearly ten years ago.